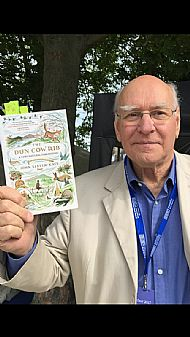 The hardback edition of The Dun Cow Rib was published in August and launched at The Edinburgh International Book Festival. This book is the story of a boy's awakening to the wonders of the natural world and is an elegy to his remarkable mother, who suffered ill health most of John's childhood. Comment from Rebecca Morris at 20:40 on 24 August 2017. I have just obtained your book Song of the Rolling Earth and am looking forward to reading it. I am very interested in the survival of the Scottish Wild Cat and would be interested to know if you have any of these magnificent creatures on the estate.